The industrial stench of oil and grease gives no hint at the true value of Peter Hobson's pile of old car parts as he throws the doors open to a cavernous barn in a remote Lincolnshire field. "I've got the largest Land Rover parts store outside Land Rover," the 60-year-old entrepreneur declares as he inspects tonnes of scrapped components that he has amassed over the last two decades. Inside the dimly-lit barn, shelves and crates are stacked high to the ceiling, each filled to the brim with filthy bits of axles and alternators, clutch levers and steering pumps. It is a collection that has been put to good use. Not only has Mr Hobson become an important employer in an English region hungry for jobs, he has also emerged as a small rival to Land Rover, the company that is currently for sale by its US parent Ford Motor. "I've more than 100 Wolf engines, and they are £7,000 each," Mr Hobson declares, rummaging around in his barn. "I've got well over 1,000 V8 engines, and 700 diesel engines. 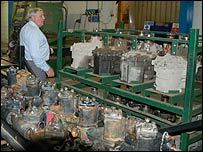 "And here, I have 1,100 transfer boxes at £450 each, and these gearboxes - I've got 800 of them - are £2,000 each." Mr Hobson reckons the bits in his barn are worth at least £25m ($50m) - and conceivably more than twice that, depending on how much his customers are willing to pay for them. "If you simply take the parts and try to sell them, you're on a hiding to nothing," he explains. Even severely damaged Land Rovers like this one will have some 60% of its parts reused. So instead, he has set up a factory nearby, in Donington on Bain in Lincolnshire. Here, Hobson Industries employs 48 workers who are busy stripping down entire vehicles into their smallest components, before reusing the bits to build major parts like engines or gearboxes, or even entire vehicles. "When you walk around here, you'll see that the company is a mini-Land Rover," Mr Hobson observes. Everything is built to military specifications, with many of the Land Rovers being kitted out as armoured vehicles. "I supply many armies around the world," Mr Hobson says - including the armed forces in Turkey, Jordan, Australia and a string of Middle-Eastern nations. But Hobson's main client is the UK Ministry of Defence (MoD). In a concrete-covered field behind Hobson Industries' rural factory, some 300 scrapped Land Rovers are stacked high, waiting to be stripped. Any day now, a further 300 MoD vehicles are due to arrive. Many of them have seen action. Some are almost completely wrecked. And yet, Hobson Industries pays for them - though not very much. "I dispose of the MoD vehicles in accordance with European Union rules, and that's where I get many of my parts from," explains Mr Hobson. "But the MoD are not fools. It would cost them money to get rid of them. Instead I buy the assets off them." 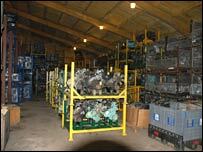 Hobson Industries then goes about the task of salvaging as much as possible from each and every Land Rover. Reusable or recoverable parts are sent through vast washing machines before they are restored. "You could not tell that from new," Mr Hobson declares as he holds up a shiny, reconditioned alternator. "You can't tell the difference and this is a fraction of the price." And whereas the restoration process might seem laborious, "it's no more labour intensive than building a new one," Mr Hobson explains. "And you've got virtually no costs." Hobson Industries sells the reconditioned parts at half the official Land Rover list-price, regardless of costs, and the components come with a two-year warranty, compared with a one-year warranty on new parts. Hence, some of the components sold by Hobson's might bring in the bacon in a big way, while others might cost more than their sales price. Production equipment is acquired in a similar fashion. If Mr Hobson wants it, he will buy it - without first considering the returns on his investment. "I am the only shareholder. I have no dividends to pay, so I choose when to buy [component] stock or tools. "If you can afford the tools and you buy the best you can afford, then it's just like buying a good spanner," he says, gesticulating towards his factory. "It's just a big box of spanners." As it happens, Hobson's toolbox is bulging. It includes a facility that strips down, cleans, modifies and rebuilds old engines, and a facility to build Borg Warner transfer boxes under licence on behalf of Land Rover, the company. And there is an electroplating kit and a starter-motor reconditioning unit, complete with a rotating electrics test bed. 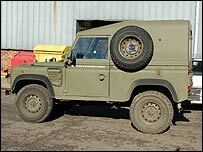 Over the years, Mr Hobson has even bought stacks of obsolete tooling directly from Land Rover, much of which has been upgraded. "I've invested millions of pounds," Mr Hobson declares. As a consequence, he has acquired everything he needs to build entire Land Rovers from scratch. "I am supplying the MoD with a brand new Land Rover at the price it was sold at 10 years ago, which is half what Land Rover charges for a new one now," Mr Hobson says. "It is a massive saving for the MoD and it is saving the taxpayer millions." Besides, he adds, the process saves on resources - natural as well as financial. "We're a first-world nation that thinks we can throw everything away. From a society point of view, this is the way to go with all vehicles." New parts are added where required during assembly, at times from external suppliers. "Where we can't do it here, we go to the people who can," says Mr Hobson, explaining how Hobson Industries has entered into strategic alliances with parts suppliers, ranging from firms making towing equipment and gearboxes to steelmakers and armoured protection firms. Take the seats, for example. They are sent to upholsterer Exmoor Trim, which strips off the covering, then reuses the frame - the most expensive part of a seat. "He will make money, I will make money and we supply the seat to the MoD at half the price of a new one," explains Mr Hobson. Other parts - such as starter motors and turbo chargers - are acquired directly from the same specialist suppliers that normally sell parts to Land Rover. 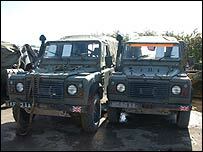 On top of that, Hobson has even acquired an extensive stockpile of obsolete, yet unused Land Rover parts - including engines - that are much in demand from armies with ageing vehicle fleets. This is causing Ford Motor a headache, since Hobson enables armies, and the MoD in particular, to delay orders for new Land Rovers. Such issues are undoubtedly being discussed with any potential buyers of Ford's Land Rover business - and whatever the outcome, it seems likely that Hobson Industries will play a part in Land Rover's future.